Road races in Vermont often mean idyllic and pastoral scenery, covered bridges, dirt roads, and small groups of runners. Most road races in the Green Mountain State are as much about the scenery as they are about the competition or raising money for charity. Here are the 10 best. The Covered Bridges Half Marathon was established in 1992 by David Chioffi to run while taking in the immense pastoral beauty around Woodstock, Vermont. The course meanders through and around four covered bridge. After a few minor adjustments, the course is set at 13.1 miles. This course starts in the Suicide Six Ski Area, through idyllic fields with views of the Ottauquechee River, across two covered bridges, and onto the Quechee Polo Field, where runners are met with a beer tent. In Derby, there is a race run in May that leads participants through the hills, valleys, and dandelion-filled fields of the Northeast Kingdom of Vermont. Only miles from the Canadian border, this 13.1-mile road race starts near Lake Salem and travel dirt roads, gaining more than 500 feet in elevation along the way. The highest point is in the middle of the run at 1,500 feet and, after taking in the dandelions, runners end up where they start, at the beach house. Rolling hills and covered bridges are on exhibit for this road race that takes place in the fall. The event starts in Lyndonville and finishes 13.1 miles later in the neighboring town of St. Johnsbury, also a picturesque Vermont town. With four covered bridges, hills, historic structures, and backcountry but paved roads, this is a race full of quintessential New England towns and scenery. The annual Old Stone House Fall Foliage Run is another small fall event that takes place in Vermont’s Northeast Kingdom. It features the typical half marathon but also offers a 12-mile bike tour that takes travelers over the backcountry dirt roads of Orleans County. All three events run a loop, starting and finishing at the Old Stone House Museum in Brownington, Vermont. Established in the late 1970s, this fall race was meant, perhaps, as a tune-up for the famed New York Marathon. In time, the race was organized by other individuals and groups, but it has remained a steadfast Manchester event. Starting at the Manchester Parks and Recreation Center, and featuring a course that’s open to both runners and walkers, the route is a serpentine affair, mostly following historical Vermont Route 7 (the Stone Valley Byway) before looping back to the Recreation Center for the finish line. For 25 years, the Leaf Peepers Half Marathon has been a fixture in Waterbury, Vermont. The October event is organized by the Central Vermont Runners Club, though Harwood Union High School students volunteer to work the six water stops on the course. Other community organizations are also on hand, like the Waterbury Firefighters and Waterbury Emergency Services. Runners report that about 75 percent of the course is on dirt roads and takes runners through the towns of Duxbury and Waterbury. 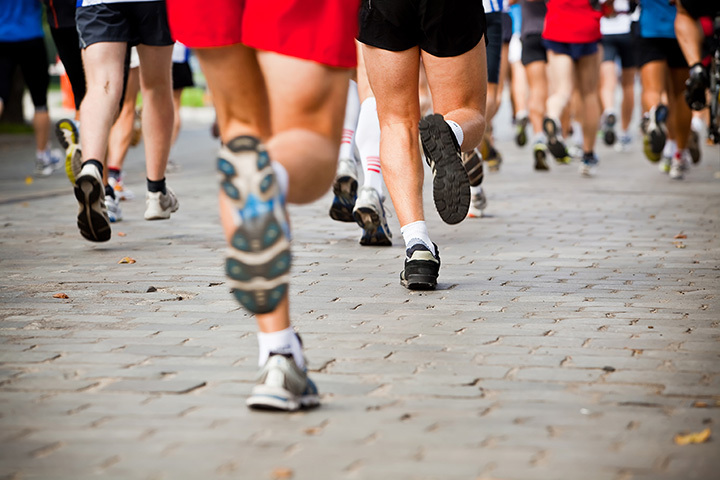 The annual Front Porches Half Marathon takes place in what can be the chilly month of October. Featuring scenic views of the Williams River and the historic front porches of town, runners start in Bellows Falls and continue through Saxtons River and Vermont Academy’s campus before ending back where they started. With the Adirondack Mountains to the west, the agrarian town of Charlotte hosts this September race that starts and finishes at Shelburne Beach. Runners can take in apple orchards, fields of hay, horses and livestock, and the shoreline of Lake Champlain. Along the way, travelers pass Shelburne Farms, and the Vermont Teddy Bear Company on this flat and fast half mile race. Perhaps the only race in Vermont that runs in November, Race Vermont features an out-and-back loop where runners pace through the idyllic countryside of the Champlain Valley. From the Shelburne Health & Fitness Center, runners make their way past Shelburne Farms, the Shelburne Shipyard, Lake Champlain, and the Adirondack Mountains. Also along the course is the Shelburne Bay Path and the historic Ti-Haul Trail. This race takes strides through a section of Vermont most people only see when there is six inches of packed powder, thanks to the surrounding ski resorts of Mad River Glen and Sugarbush. Nevertheless, runners will start at the Mad River Green and pass through Waitsfield Village. From there, the scenery gets decidedly more rural, and a combination of tree-lined country roads and grassy, open fields unfold. Scrag and Bald Mountains slowly come into view, and the course climbs roughly 900 feet before a long, gradual descent toward the finish line. Remember, there are more races in Vermont than we can fit on this list, so hit the road, get some exercise, see some amazing sites, and help support local charities just by putting on a racing bib and running. View more Vermont Road Races.